The present research was carried out to investigate the pattern of skin prick test reactivity to various aeroallergens among patients of respiratory allergy, i.e., BA and/or AR in India, in order to facilitate effective strategies for management of these allergic conditions. A retrospective study was conducted in patients with bronchial asthma and/or allergic rhinitis, attending department of Respiratory Allergy and Applied Immunology at the National Center of Respiratory Allergy, Asthma and Immunology, Vallabhbhai Patel Chest Institute (VPCI), University of Delhi, Delhi, India. Allergy testing was performed during the period of august 2008 to august 2011. A total of 918 patients consisting of 548 (59.69%) males and 370 (40.31%) females, in the age group of 6-80 years (mean age of 30.10 years), were included in the study. Diagnosis of bronchial asthma and allergic rhinitis was made according to the GINA  and ARIA  guidelines, respectively. All patients were non-smokers. There was no associated history of tuberculosis, diabetes mellitus, hypertension, endocrine disease, or coronary artery disease. Pregnant females were excluded from the study. Hemogram, sputum, and chest radiography were done to rule out an alternative diagnosis. Before performing SPT, oral drugs including anti-histamines, steroids, and any other drugs considered to affect SPT were stopped 1 week prior to the tests, but inhaled drugs were continued. Oral short acting anti-histamines were stopped 1 week before, and long acting anti-histamines were stopped 4 weeks before performing the tests. There were a total of 918 patients consisting of 548 (59.69%) males and 370 (40.31%) females, in the age group of 6-80 years (mean age of 30.10 years). The patient's age distribution is given in [Table 1]. The maximum numbers of patients (261; 28.43%) were between age group of 20 to 29 years. 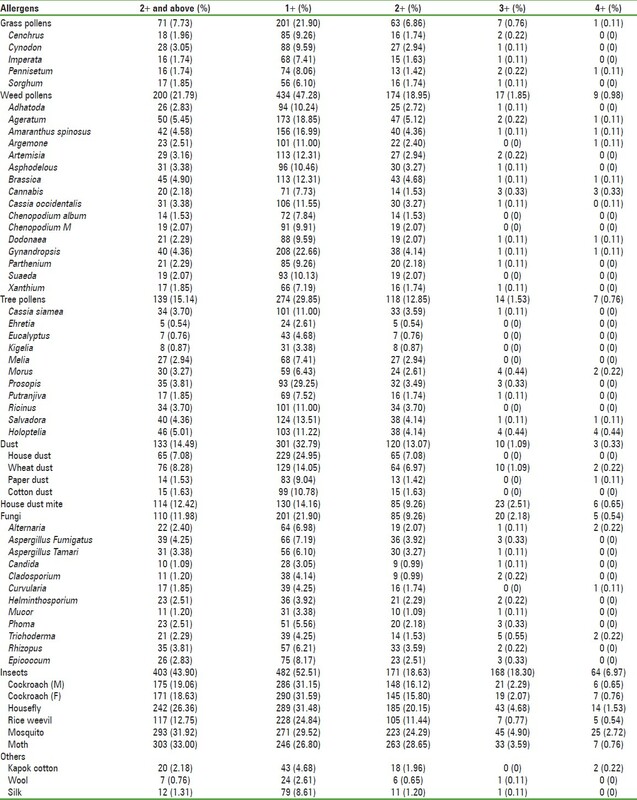 The maximum number of patients (57; 62.53%) had duration of suffering ranging from 1 to 10 years [Table 2]. Patients diagnosed with bronchial asthma were 191 (20.81%), allergic rhinitis were 305 (33.22%), and both bronchial asthma and allergic rhinitis were 422 (45.97%) [Figure 1]. In our study, a total of 53244 skin prick tests were performed with a total of 58 allergens on 918 patients, out of which only 6 (0.65%) patients had no reaction at all from SPT, whereas 255 (27.78%) patients had a positive SPT up to the 1+ grade (mean wheal diameter measuring less than 3 mm). Significant skin positive reactions (2+ and above) were found in 657 (71.57%) subjects. The younger adults aged 20-29 years were the most commonly affected group with 197 (21.46%) significant skin positive patients [Table 3]. Insects (43.90%) followed by various types of weed pollens (21.79%), tree pollens (15.14%), dust (14.49%), house dust mite (12.42%), fungal spores (11.98%), grass pollens (7.73%), kapok cotton (2.18%), silk (1.31%), and wool (0.76%) were the offending allergens [Figure 2]. Among individual allergens, most common aeroallergen was moth (33%) and least common was ehretia (0.54%). 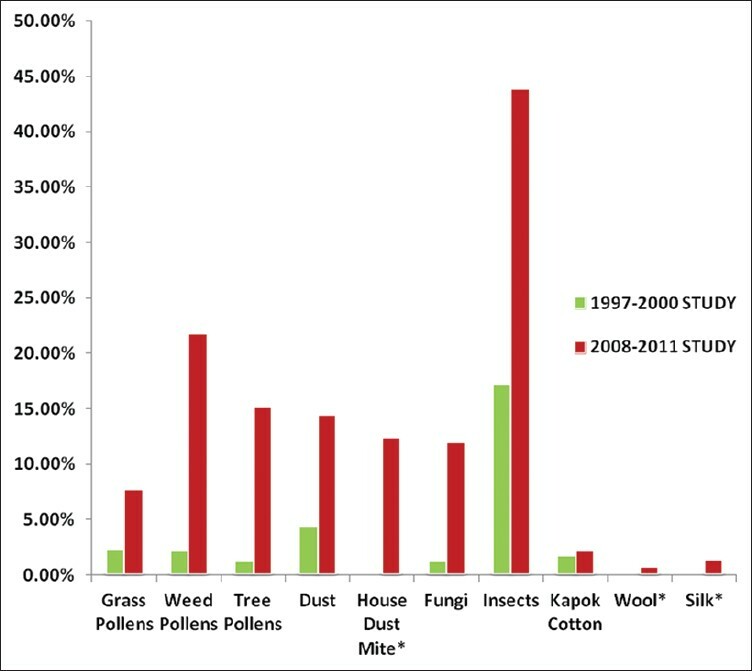 Among grass pollens, Cynodon (3.05%) was most common allergen showing significant positive SPT followed by Cenchrus (1.96%), Sorghum (1.85%), Pennisetum (1.74%), and Imperata (1.74%). Among weed pollens, Ageratum (5.45%) was most common followed by Brassica (4.90%), Amaranthus spinosus (4.58%), Gynandropsis (4.36%), Cassia occidentalis (3.38%), Asphodelous (3.38%), Artemisia (3.16%), Adhatoda (2.83%), Argemone (2.51%), Parthenium (2.29%), Dodonaea (2.29%), Cannabis (2.18%), Suaeda (2.07%), Chenopodium M (2.07%), Xanthium (1.85%), and Chenopodium album (1.53%). Among tree pollens, Holoptelia (5.01%) was most common followed by Salvadora (4.36%), Prosopis (3.81%), Ricinus (3.70%), Cassia siamea (3.70%), Morus (3.27%), Melia (2.94), Putranjiva (1.85%), Kigelia (0.87%), Eucalyptus (0.76%), and least common was Ehretia (0.54%). Among dust, the wheat dust (8.28%) was the most common, followed by house dust (7.08%), and cotton dust (1.63%), but the least common was paper dust (1.53%). House dust mite was significantly positive in 114 (12.42%) of subjects. Among the fungal spores, Aspergillus fumigatus (4.25%) was the most common followed by Rhizopus (3.81%), Aspergillus tamari (3.38%), Epicoccum (2.83%), Phoma (2.51%), Helminthosporium (2.51%), Alternaria (2.40%), Trichoderma (2.29%), Curvularia (1.85%), Cladosporium (1.20%), and Mucor (1.20%), but the least common was Candida (1.09%). Among insects, moth (33%) was the most common allergen showing significant positive skin reaction, followed by mosquito (31.92%), housefly (26.36%), cockroach-male (19.06), and cockroach-female (18.63). The least common was rice weevil (12.75%). Kapok Cotton was significantly positive in 20 (2.18%) patient, wool in 7 (0.76%), and silk in 12 (1.31%) [Table 4]. High prevalence of skin reactivity to insects, weed pollens, tree pollens, dust, house dust mite, and fungal spores demonstrates the increase in significant skin reactivity than previous study. This is in line with increasing prevalence of respiratory allergy, i.e., BA and/or AR. The variation in the prevalence of aeroallergen reactivities in different region is due to different geo-climatic condition and adaptation of specific microbiological flora and fauna in specific climate. The variation of skin reactivity may also be attributed to change in specific pattern of vegetation over a period of time as a result of changes in geo-climatic condition. The increasing trend in skin reactivity as compared to our previous study may also be due to addition of prevalent aeroallergen like house dust mite in our study. One of the management protocols can be avoidance of common aeroallergens prevalent in that part of world although it is not so easy. The identification of most prevalent and also the full spectrum of aeroallergens responsible for respiratory allergies (BA and/or AR) has a very important role in management of these conditions. Our study will help in selecting the most specific and most cost-effective panel of aeroallergen antigens for SPT as the appropriate diagnostic test, and hence will help in finding the best formulation of allergen specific immunotherapy as an effective treatment. The study concluded that 657 (71.57%) patients of respiratory allergy, i.e., BA and/or AR in the study sample, suffered from poly-sensitization from different aeroallergens. There was a marked increase in sensitization as compared to our previous study. Sensitization was most common in the younger age group of 20 to 29 years with 197 (21.46%) patients. 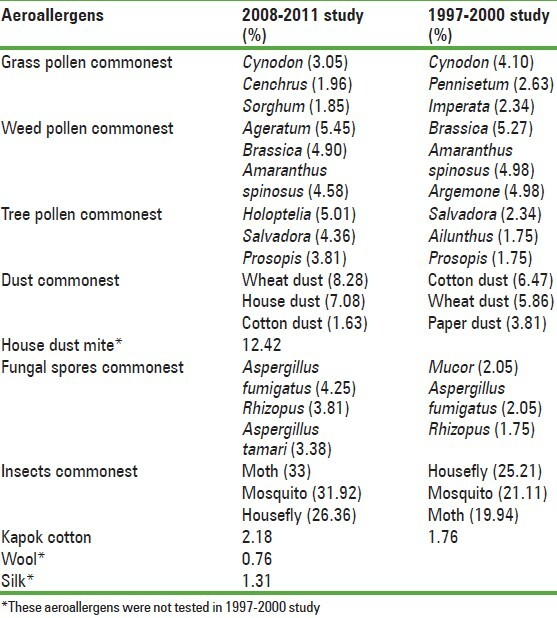 In our study, insects (43.90) were most common offending aeroallergens, followed by various types of weed pollens (21.79%), tree pollens (15.14%), dust (14.49%), house dust mite (12.42%), fungal spores (11.98%), grass pollens (7.73%), kapok cotton (2.18%), silk (1.30%) and wool (0.76%). The information from our study may be useful to clinicians managing patients suffering from respiratory allergies. Allergen-specific immunotherapy is a viable option for these patients. It can be used in combination with conventional therapy to maximize the outcome. 1. Pedersen PA, Weeke ER. Asthma and allergic rhinitis in the same patients. Allergy 1983;38:25-9. 2. Smith JM. Epidemiology and natural history of asthma, allergic rhinitis, and atopic dermatitis (eczema). In: Middleton E Jr, Reed CE, Ellis EF, editors. Allergy: Principles and Practice. 2 nd ed. St. Louis: Mosby; 1983. p. 771-803. 3. Grossman J. One air way, one disease. Chest 1997;111:11S-6. 4. Morris MJ. Asthma. Available from: http://www.emedicine.com/med/topic177.htm. [Last accessed on 2005 Jun]. 5. Howarth PH, von Mutius E, Martinez FD. Allergic and non allergic rhinitis. Natural history, development and prevention of allergic disease in childhood. In: Middleton's allergy principles and practice. USA: Mosbey; 2003. p. 1391-407. 6. Holgate ST, Broide D. New targets for allergic rhinitis- a disease of civilization. Nat Rev Drug Discov 2003;2:902-14. 7. Settipane RA. Complications of allergic rhinitis. Allergy Asthma Proc 1999;20:209-13. 8. Van Cauwenberge P, Bachert C, Passalacqua G, Bousquet J, Canonica GW, Durham SR, et al. Consensus statement on the treatment of allergic rhinitis. European Academy of Allergology and Clinical Immunology. Allergy 2000;55:116-34. 9. Williams PB, Dolen WK, Koepke JW, Selner, JC. Comparison of skin testing and three in vitro assays for specific IgE in the clinical evaluation of immediate hypersensitivity. Ann Allergy 1992;68:35-45. 10. From the Global Strategy for Asthma Management and Prevention, Global Initiative for Asthma (GINA) 2011. Available from: http://www.ginasthma.org/. [Last accessed on 2012 Oct 31]. 11. Brozek JL, Bousquet J, Baena-Cagnani CE, Bonini S, Canonica GW, Casale TB, et al. Global Allergy and Asthma European Network; Grading of Recommendations Assessment, Development and Evaluation Working Group. J Allergy Clin Immunol 2010;126:466-76. 12. Shivpuri DN. Comparative evalution of the sensitivity of common methods of diagnostic antigen tests in patients of respiratory allergy. Ind J Chest Dis 1962;4:102-8. 13. International Consensus Report on diagnosis and management of rhinitis. International rhinitis management working group. Allergy 1994;49:1-34. 14. Singhal P, Rajkumar. A study of skin sensitivity to various allergens by intradermal test in patients with respiratory allergy (bronchial asthma and allergic rhinitis) in India. Intern Med J Thai 2003;19:202-7. 15. Ghaffari J, Khademloo M, Saffar M, Rafiei A, Masiha F. Hypersensitivity to house dust mite and cockroach is the most common allergy in north of Iran. Iran J Immunol 2010;7:234-9. 16. Almogren A. Airway allergy and skin reactivity to aeroallergens in Riyadh. Saudi Med J 2009;3:392-6. 17. Farhoudi A, Razavi A, Chavoshzadeh Z, Heidarzadeh M, Bemanian MH, Nabavi M. Descriptive study of 226 patients with allergic rhinitis and asthma. Iran J Allergy Asthma Immunol 2005;4:99-101. 18. Madden KJ, Forrester TE, Hambleton IR, Lewis N, Greenough A. Skin test reactivity to aeroallergens in Jamaicans: Relationship to Asthma. West Indian Med J 2006;55:142-7. 19. Bener A, Safa W, Abdulhalik S, Lestringant GG. An analysis of skin prick test reactions in asthmatics in a hot climate and desert environment. Allerg Immunol 2002;34:281-6. 20. Liam CK, Loo KL, Wong CM, Lim KH, Lee TC. Skin prick test reactivity to common aeroallergens in asthmatic patients with and without rhinitis. Respirology 2002;7:345-50. 21. Pumhirun P, Towiwat P, Mahakit P. Aeroallergen sensitivity of Thai patients with allergic rhinitis. Asian Pac J Allergy Immunol 1997;15:183-5. 22. Chew FT, Lim SH, Goh DY, Lee BW. Sensitization to local dust-mite fauna in Singapore. Allergy 1999;54:1150-9.